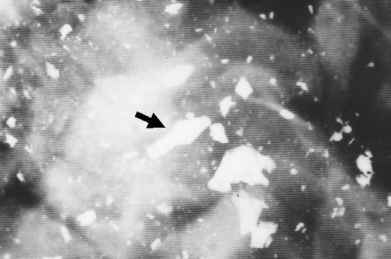 Figure 5.11 Loose-contact wound with circular zone of soot around entrance. in seared zones, such as seen in near-contact wounds, the seared skin is heavily impregnated with soot, whereas in this impact zone it is not. This zone is often wider than the diameter of the barrel because the skin has been bent back around the end of the barrel, totally enclosing it. A loose-contact wound is produced when the muzzle of the weapon is held in very light contact with the skin at the time of discharge. The skin is not indented by the muzzle. Gas preceding the bullet, as well as the bullet itself, indent the skin, creating a temporary gap between the skin and the muzzle through which gas can escape. Soot carried by the gas is deposited in a band around the entrance (Figure 5.11; see also Figure 4.2). This soot can be easily wiped away. A few unburnt grains of powder may also escape out this gap and be deposited on the skin in the band of soot. Particles of powder, vaporized metals, and soot will be deposited in the wound track along with carbon monoxide. Angled and incomplete-contact wounds and their appearances have been discussed in detail in Chapter 4 (see Figures 4.3 and 4.4).